129 Responses to What Does A Dog’s Panting Tell You? Our 14 year old yellow lab/chow mix has arthritis and has recently started with a lot of panting, restlessness and just plain not settling down even when told to lay down. Much of the time he seems fine, but afternoons and at night and early morning he goes through extended periods of this behavior. I have been giving him a low does aspirin for the arthritis, which seems to help some, but I am afraid to give him too much aspirin. It appears that after being in a sedentary position or being up and active for a while, your dog is more likely to have difficulty moving because of joint pain, thus the excessive panting. We advise you to take your pet to your veterinarian, as there are some very good medications that can ease your dog’s pain. We don’t recommend giving any medications that have not been prescribed by a veterinarian. What does the aspirin do? Pain relief? Blood thinner? Hi Judith, I will let Sam reply, but please read our comment about the danger of giving human drugs whether over-the-counter, or pharmaceuticals to pets without a Vet’s recommendation. I would not give he m aspirin! Its dangerous for dogs! U can go to online such as chewy they make a safe canine pill similar to human aspirin, also if arthritic there is a great joint pain supplement , duralactin. Works wonders for my lab who is 10 years old. God bless. Hi Charles, thank you for your comment and suggestion. In our research, we did learn that Vets and Herbalists have successfully recommended white willow bard for years to relieve arthritic pain and inflammation in pets. It is used mostly for dogs with pain, as cats are extremely sensitive to salicylates and can easily overdose due to this sensitivity. We would recommend to our readers that you consult a professional to be sure it is the right product for your pet and that you administer the proper dosage. Again, thank you so much for your suggestion, Charles. Hello Anna marie, thank you for your comment. Our blog posts are meant to be informative and at times entertaining, covering many issues. We offer ideas, and suggestions based on our research. Our panting blog has received so many comments and questions about specific dogs and specific issues petparents are having with their dog. As mentioned, panting can be something as simple as a dog’s way of perspiring or it can be more serious. We can only offer suggestions based on our research. We are not Vets and therefore cannot diagnose. Aspirin is made from willow bark. You are giving your dog aspirin. Thank you for your reply to Brent’s comment. To further elaborate on this, white willow bark contains salicin which is useful in making aspirin. Salicin is crucial in creating salicylic acid, which can be utilized as an antibiotic, in addition to helping with several other ills. Dogs can take white willow bark, but the dosage should be administered only after consulting a Vet, since research shows that the dosage that is administered makes a big difference between helping your puppy and damaging them. Our 11 year old black lab just started pacing , panting constantly yesterday. Making sure he see his owners all the time. Will not settle down even when asked to lie down. Less barking too? He takes fish oil daily for his knees. Very concerned. Thank you for reading our blog and for your comment. We are so sorry to hear about the changes that are recently happening to your black lab. We know from our research that a change in your dog’s panting patterns can be, but not always, a sign of something serious. We are very glad that you have recognized this change and are reaching out. It does appear there is something going on with your lab given the agitation, change of behavior and not wanting to leave your sight. There could be a number of different reasons for his excessive panting and what appears to be anxiety. We highly recommend you take him to your Vet to be sure there is nothing serious going on. We hope it is minor, and maybe the onset of arthritis, which is common among older dogs and can be treated fairly easily. Please let us know his progress, we care and appreciate hearing back. medical marijuana for dogs. It really helps. Only got it 2 days ago. He does try to play with his toy, I throw it 2x and he lays down. Im sure he’ll keep feeling better. Hello Charles, Thank you for informing us of how your dog Beau is reacting to natural herms and medical marijuana for dogs. With medical marijuana being a fairly new prescription for certain ailments, it is so good to hear that it is working for Beau. We really appreciate your comment. Please come back and visit us and we wish that Beau continues to feel better. Thank you for your question, Fiona. Although we are not Vets, we have looked into the magnetic collar. We found from our research that a majority of owners of pets with arthritis truly believe the magnetic collar has helped their dogs. Many have said that their Vets were amazed at the results. Often the magnetic collars are used with the prescribed medications, and in some cases, the dosages were reduced due to the positive effects of the collar. The good news too, is that it seems there are no “side effects” caused by the collar and from our research, it appears to be a great next step to include in your Lab’s treatment. It is great that you have been taking your Lab to a Vet, since per our blog, other conditions can cause excessive panting. Good luck and we hope your Lab’s arthritic condition lessens! My 14 year old golden retriever was diagnosed with dissolving disks in her lower back. She is on 32 kg. of metacam at night plus 1 tablet apo-gabapentin in the morning & at night. At night she constantly wakes up at night with excessive panting, enough to cause the bed to shake. Any ideas of what could be happening? Thank you for your question. We are sorry about your golden retriever’s back discomfort. As mentioned in our blog about excessive panting, it may be that your dog is panting in response to pain or it could be a reaction to a medication or onset of dementia. At our Tails Untold blog, we offer information gleaned from research on a topic and much of this is obtained from veterinarian websites, case studies and a consensus of information that is current. It is stressed in all of our blogs that medical concerns should be taken up with your veterinarian. It looks like yours has prescribed medication and perhaps you need to follow up with a visit to him or her to explain that your pet is still appearing to be in distress. We wish you good luck and give that special pet a hug for us! I have a 13 year old australian cattledog mix. he pants excessively. he has arthritis. he is on tramadol because is liver enzymes are high and he cannot tolerate rimadyl. the panting has just started in the last few months. it seems the arthritis is progressing. any suggestions? Thank you for your question. We are sorry about your pet australian cattle dog mix. As mentioned in our blog about excessive panting, we had a similar question recently and it may be that your dog is panting in response to pain or it could be a reaction to a medication or onset of dementia. I would talk to your Vet about the fact that even with tramadol he still seems to be showing signs of discomfort. At our Tails Untold blog, we offer information gleaned from research on a topic and much of this is obtained from veterinarian websites, case studies and a consensus of information that is current. It is stressed in all of our blogs that medical concerns should be taken up with your veterinarian. We wish you good luck and give that special pet a hug for us! Thank you for your comment, Mindy. This is very nice of you to share and I am sure it will help others with the same issue! We hope your Golden continues to be comfortable, you are certainly taking great care of him! So far , the best for my labbie joint pain has been duralactin. Vanilla flavored chewable. Made so much difference in mobility, mood and pain, good luck. Thank you. We really appreciate your comment. This is good news to share for those whose pets have joint pain. It is something to check out with their Vet. It appears that your wonderful Jack Russell does have some kind of anxiety going on before bedtime. We have heard that dogs may have nightmares, but since we are not veterinarians, we are not qualified to prescribe any remedies. We advise you to take your pet to your veterinarian, as there are some very good anti-anxiety and anti-stress medications (should that be the issue) both holistic and pharma on the market today. We wish you the best of luck with your Jack Russell, an adorable breed. We would love to know her progress! My 6yr old jack just started doing exact same thing, not off his food or walks but excessively clingy,,shaking, and panting. I did joke to my daughter it’s like he’s had a nightmare! It’s been going on now for about two weeks…..? Hello Andrea and thank you for writing. Not being Vets, we cannot diagnose the situation. It sounds as if you 6 year old Jack’s panting and other behavior has changed. The fact that he is shaking and more clingy, in addition to panting, does sound like there has been a change in how he is feeling. Since it has lasted two weeks, it seems it is not a passing anxiety attack, or temperature issue. We do suggest when there is changes in behavior and/or panting that it is best to take him to your Vet to have him looked at and to be sure it is not something serious, which we hope it is not. Please let us know what the Vet says or does, as we like to learn more about situations like this so we can share with our blog readers. I have a 8 months old Labrador retriever. He is all normal till two days before. then he started to pant. when he gets up from a sleeping position and starts to walk normally he is panting.I have never observed him doing so before. When i took him to the vet they said that he has worms and had done deworming . and also gave him predisolone injection because he is itching here and there . There are no fleas or ticks too. he wakes from his sleep and comes to me panting . I am worried whether is he alright or not. It is Ok in summer but i am worried because it is cold still here in india. Please do help me ASAP !! We appreciate your comment, Sudha. We are very sorry to hear of your puppy’s panting issue. The best thing you could’ve done was to take him to the Vet. Vet’s are educated to understand, diagnose and treat all different issues and ailments in pets. In writing our Tails Untold Personalized Pet Book Blog, we research and write about all different topics, but we are not trained to treat animals. My suggestion would be to contact the Vet again and let him know the panting is continuing. Please let us know how he is doing and we hope the problem clears up soon. I have a male pure breed shetland sheepdog (not neutered) going on 13 years old. He had started randomly pacing and panting this evening. This had happened before but within a few days later he was back to normal. Now hes at it again. He’ll lay down for maybe 30 seconds then get up and pace again. We have tried giving him anti anxiety tablets but they dont seem to be helping. He usually will bother us with pacing if he needs to go out, but hes already been on 2 walks today, drank water and ate his food like he normally does. Ive done some research and nothing has really helped. Should we take him to a vet? Thank you for your comment on our blog post about “What does a Dog’s Panting Tell You?” We love to research and inform our blog readers about all different and interesting topics, so we appreciate your being part of our community. As we mention, panting often increases in more senior dogs, and sometimes this can be due to pain, which can often be treated when the cause is determined. Since we are not trained veterinarians, we do suggest if you have concerns about your dog’s behavior, then taking him to your vet is the most prudent thing to do. Great luck with your Shetland and please let us know how he is doing. Please also visit us for new blogs and share. Thank you, again. Did you ever figure out what was causing the behavior with your Sheltie? My 10 year old sheltie has just started the same thing. I have a 3 month old black lab, I got him when he was 5.5 weeks old. He’s ALL puppy! But noticed last night that he was panting heavily, and restless. We go to bed at 10p and he usually will lay down and sleep with us, but starting last night poor thing was panting so hard. Noticed during the day he was pretty laid back. We feed him a cup of pedigree food in the morning, lunch and dinner around 6p. Is that enough for a puppy? My neighbor watched him for us during the day for us, not sure what he might have fed him. But he is a firm believer of feeding a puppy till they get full. We don’t do that, our lab would eat a whole bag of food it that was the case! But this panting thing that just started last night has me bothered. Thank you for your comment, Treasa. We love labs and I am sure your little one is adorable. When we write about a topic, we research it as best as we can to provide our readers with information about different situations that they might experience with their pets. We are not licensed veterinarians and highly recommend when a situation occurs that seems unnatural or out of the ordinary, that you take your pet to the vet. There may be several reasons your puppy is panting; (anxiety, pain, and perhaps in your case, over eating or eating food that is new to his/her digestive system. Your vet would be the best one to help diagnose this and also to provide you with the recommended food quantities. We wish you and your little black lab good health and please write back and let us know. Thank you and keep visiting us and sharing. Your friends with Tails Untold Personalized Pet Books, http://www.tailsuntold.com. My golden is 15 in August this year and has recently been panting heavily. She doesn’t seem in pain though. She still does the toilet fine, still has her big appetite, still runs about and plays and seems happy! She has had arthritis in her back leg for a few years now and we give her coconut oil in her food to help with that which it seems to do. Maybe it’s just been sore for her recently? Other than that she doesn’t seem to have any other health problems! Thanks for your comment, Chloe. We love Golden’s and how wonderful she is 15 years young. As we mentioned in our blog, panting can be a sign of pain and perhaps your Golden’s arthritis has gotten slightly worse. Many pet owners whose dogs have arthritis mentioned that coconut oil has seemed to help. We do suggest that if the panting increases you take your dog to the vet to rule out anything more serious. The vet may prescribe an arthritis drug that may be more effective thank coconut oil, if the arthritis has worsened. We are so glad she seems to be doing really well, with no other health problems, and hope that continues. Great luck with her! Come back and check out our additional blog posts. We love to hear from you. My 9 year old female german shepherd has currently began panting in her sleep constantly. I’m alittle concernd because i make sure she is not overheated with blankets (she sleeps in my bed) but the panting continues for about 30 minutes or even longer! I also make sure she has areas to breath because she likes to bury her head in pillows so she can’t breath but I make sure she doesn’t. So I’m just wondering what’s going on with her. Open to any answers. Hello and thank you for visiting our blog and your comment. We are sorry for the delay in response as we had issues with this blog and receiving comments. As we mentioned, panting can be caused by many situations including anxiety, pain, allergies and more. The best thing we can recommend is to take your German Shepard to your Vet to try and find out the cause. We hope your little lady is better now and please let us know, we really care! my 6 year old mini schnauzer has been panting heavily the past day or so. She has been very itchy also lately (she has a grooming appointment tomorrow) can this heavy panting come from the anxiety of the horrible itching? I have tried every home and over the counter remedy for itchy skin and nothing has worked. First, we must apologize for the delay in response. Since we are not Veterinarians, we cannot diagnose your mini schnauzers panting issue. It could be an allergy (food, environmental, or other causes), but we cannot be sure. We highly recommend taking your mini schnauzer to your Vet. Please let us know how your little furry member is doing. Thank you for visiting our blog and your comment. According to my vet, my 15 1/2 year old mixed Bichon, Carin Terrier, Retriever is in good health except for stiffness when he gets up after sleeping or lying down for a while. I give him joint EZ Plus by Sergeants once a day. He is 20 lbs and 15″ tall and is slowing down a bit. I bought him stairs which he uses all the time to get on and off my bed. Recently I’ve noticed that there are times that he pants heavily and a lot for no apparent reason. Heat, exercise, and weight are not at issue. If it’s hot, I keep the a/c on for him even when I’m out. He seems to pant more in the morning and at night. He was at the vet recently for a checkup and she found nothing abnormal about his heart. Should I take him for a second opinion? Or do anything else? We are sorry for the delay, we were having issues with this wordpress blog. We are firm believers in second opinions if that is an option. We have often heard of circumstances where one’s Vet could not figure out the problem, and so another Vet, usually one that is recommended by a friend, has found the cause of the panting and anxiety. As we all know, this can happen in the case of humans also. Please keep us informed as we care about your special furry family member! We are so sorry for the late reply, we had issues with our blog. I hope your Snoopy is doing better. We know that making the decision to let your furry family member move on to the Rainbow Bridge is a very, very, tough one. We always recommend discussing with your Veterinarian when it seems the time is getting nearer. We all don’t want any of our pets to be in pain or suffer and that is why a consultation with your Vet is best advice we give. They are trained to understand the emotions involved with family and the quality of life you want for your Snoopy. Please let us know how you are all doing, we care! I have a 17 year old rat terrier. She is very restless especially at night. She’s always been obedient but lately she losses bladder control and will not lay down at night at bedtime and now she’s began panting along with all other symptoms. Please advise.. I wish we could help to diagnose. We are not Veterinarians and therefore we cannot diagnose this issue. It does sound like you should take your Rat Terrier to the Vet, as there could be many reasons why the loss of bladder control and restlessness. Please let us know how you make out. We truly appreciate your visiting our blog regularly and we appreciate your comments, too. Since we are not Vet’s we cannot diagnose what is happening with your Weimeraner, but it does sound like he might be in pain. We suggest discussing with your Vet. We have heard that certain drugs and/or combination of drugs can cause this type of behavior. Your Vet would be the best person to speak with and perhaps an adjustment in the medications may help. Great luck and please let us know your special guys progress. Thank you for reaching out to us. HELLO SUSAN. First I did read closer to the top . about someone giving there . Pet ( fentenal ) . Well I,m 72 and approx.. 6 yrs ago my family dr, put me on fentenal , first 25mg patch , then the 50 mg patch . then the 75 patch . and finally the 100 MG patch . well I do have different med. problems . But the fentenal was for back injury . And the pain was unbearable . I drove transport truck for 41 yrs. long haul . But please pet lovers . do not experiment with trying different drugs if your dog comes down with a pain . please take you baby to a vet. I have a 8 yrs old pomerian x . and lately I,ve noticed he is having problems getting up the stairs . so on Friday , my rusty boy will be at the vet . And get the proper treatments needed . I,m also facing blindness from glaucoma . in the near future . as I,ve had to give up driving . for fear of killing some innocent person or family. but I,m not rich , but what ever my rusty needs . is to be care for by our vet . I,ll never watch my dog suffer in pain . as long as I live . again PLEASE DO NOT PLAY DR. WITH YOUR DOG. THEY DEPEND ON US. LET,S NOT LET THEM SUFFER . EVERY BODY HAVE A GREAT DAY , AND LOVE YOUR PET . SINCERELY , RALPH SMITH , MISSISSAUGA , ONTARIO . CANADA . Hello Ralph, We really appreciate your visiting our blog and for your comment. We are so sorry for your own pain and that of your “rusty boy”. We totally agree with you, that we should leave medical advice up to the Professionals, those that have studied and practiced medicine, and this goes for humans as well as pets. Thank you for taking good care of your “rusty boy” and knowing that a Vet is the best place to go when you see a change in behavior of your pet. We hope both of you get well and stay well. Come back and visit us often and thank you, again. We are so glad you took your Beagle to the vet. Please let us know the outcome and thank you for your comment. I have a 5 years old female greatdane. From last evening she is panting heavily and is restless even drinking water at an even interval. I gave her a rantac tablet as I thought she had an gastric attack. Still its not normal . She is willing to go for a walk but we are not allowing her for a heavy walk. Can you please tell me what might be a problem with her. I don’t have a good vet at my place . We are so sorry to hear about the situation with your 5 year old Great Dane. As we stated, we are not vets and therefore cannot diagnose your pet’s situation. There are many places that have vets that make house calls and there is also something called Vets on Call on Facebook. Here are the websites: http://www.vetlocator.com/housecallvets.php and https://www.facebook.com/vetsoncall. I really hope this helps you and your wonderful Great Dane. Please let us know as we really care! My 2month old puppy will constantly wake up panting as if she was scared. Is it because she has been seperated from her siblings and parents ? I just bought her and im worried it could be health related. Per our article, excessive panting could be caused by many reasons. Our first suggestion is to contact your veterinarian who may want to rule out any medical issue your puppy may have. There could be several reasons she is panting: 1) Panting is a cooling mechanism, so if it is hot, your puppy pants in order to cool off. 2) Separation anxiety/stress/fear can cause excessive panting. 3) Pain could cause this, or high fever, another reason to consult your Vet. If not a health issue, she may outgrow this panting as she begins to feel more secure. Sometimes a special blanket or toy with your scent on it can help. Like you, we want your little girl to be healthy and feel safe and secure. Let us know how she progresses! We have a pug who is 10 1/2 years old. He has been in relatively great health. Two years ago he had a growth on his spleen and we took him to Virginia Tech Veterinary Hospital. They took excellent care of him and removed his spleen and said there were no cancer cells. Pugs are prone to ear infections. He was given Prednisone a week ago 20 mg pills cut in half and given to him once a day. He has been on them for 6 days now and we now start weaning him off of the prednisone by giving him a half a pill every other day for 3 days. So tonight he has had no Prednisone. For the past 3 nights he has woke up panting very heavily and this goes on all night. During the day he seems to be fine. I have read that panting is a reaction to the Prednisone. It just has me a little concerned as to why it only happens at night and not during the day. He doesn’t seem to be in any pain. Thank you for your help. Hello Lisa, Thank you for writing. We are so sorry your pug is having this issue. Since we are not Veterinarians, we cannot diagnose and we do suggest you contact your vet to discuss the excessive panting. Explain that it started right after finishing the Prednisone. Your Vet will probably check for pain first, by doing an excessive pain test and then do extensive blood work to see if there is anything else going on. If there is labored breathing along with the panting, one Vet mentioned testing for Cushings, Addison’s Disease and/or a Thyroid test. If nothing shows up, they will often test different pain medications to see if that helps. If your pug is arthritic, the pain may come mostly at night when not active. Again, the best advice is that if you see changes in your dog’s panting behavior, outside of the norm, it is a good idea to see your veterinarian. We all want our pets to enjoy the best quality of life they possibly can! Please keep us informed, we care! We have a 12 yr old female border collie/lab mix. She has been the picture of health aside from the requisite hip arthritis until the past few months. She developed an ear infection which resulted in an aural hematoma, which is now resolved. Unfortunately the infection returned, and she has been on antibiotics for a month, with the infection finally almost clearing up. What is concerning me is that for the past few weeks, she has begun jumping up for no reason at random times, refuses to leave our sides, whines all the time, and pants nearly incessantly. She still eatsaid and drinks normally, goes out unassisted, enjoys regular walks, and plays as often as her limited motility allows. We have tried everything we can think of to calm her down, and nothing lasts longer than a few minutes unless she finally goes to sleep. Any ideas or recommendations? Hello Laura, Thank you for visiting our blog and for your comment. We are sorry to hear about the health issues your Border Collie/lab mix has been having. Thank goodness the ear infection/aural hematoma is healing. Arthritis unfortunately is fairly normal in senior dogs. There are many things that can be done to help relieve arthritic or other types of pain through medications, acupuncture, and/or physical therapy to name a few. We know that panting is normal for dogs to regulate their body temperature since they don’t sweat like we do. When there is excessive panting even when your pet is in a comfortable, temperate room, it is usually a sign that something is wrong. It can be for a number of reasons, and pain can be one of them. The whining, constant need to be near you and excessive panting can be a sign that she is in pain. It could be from the arthritis but it could also be for other reasons; cardiovascular, neurological, hormonal, respiratory to name a few. Your Vet can do a number of tests to help find out if your pet is in pain or if there is something else causing this. We do highly recommend, when you see a change in your pet’s behavior, in your pet’s case, excessive panting, jumping up inexplicably, whining and needing to be near you continuously, a trip to the Vet is the best recommendation we can provide. Please keep us up to date, we truly care and best of luck. Susan, you should just let people comment and not respond if all you have to say in nearly every single response is “sorry and to go visit a vet”. I’m sure many people have already tried the vet multiple times, like we have. They are clueless to what the problem is. Cheers. Hi JJ, if you check out many informational blogs like ours, you will see the same qualifier. Our blog is for informational and enjoyment purposes, and we are not qualified to diagnose. We feel it is important that our readers know this. We know many pet parents who have great faith, trust and admiration for their Vet. Our suggestions is for you to consider finding another pet parent and asking for them for a good, qualified Vet recommendation. Hopefully, a new Vet will be able to find out what your pet’s problem is. I have a 10 yrs old Pug, who is slighty overweight, not obese. She just, out of blue, started panting today and is somewhat “distant” from the other pugs. She would climb up the doggy steps and lay on the couch, staying there quietly. I noticed she was pacing around the house earlier in the day. We live in Michigan and it’s very cold out today, so it’s definitely not the heat. The heat indoor is set very low since I am almost always hot, thanks to menopause. She does have some arthritis. Is this panting something I should worry about? Hello Donna and thank you for visiting our blog. We are so sorry to hear about your Pug’s panting. We are not Veterinarians, but from all our research, excessive panting, especially when your pet is in a comfortable, temperate setting, more often than not means something is wrong. Panting is normal, especially in the warmer/hotter weather, since this how a dog sweats and cools down. In your case, even when the temperature is comfortable/cool it sounds like her panting has increased. The fact that she is pacing, maintaining a ‘distance’ from the others, sounds like this is a change in behavior. It is always recommended that when you see a change in behavior, especially excessive panting, that you make an appointment with your Vet to rule out anything serious. Often panting means pain and it could be something easily diagnosed, such as arthritis, but it is best to have a licensed Vet make the diagnosis. We hope it is nothing serious and are sending well wishes! Please let us know how she is doing. We are not Vets, but from the sounds of this, you should take your pit bull to your Vet to be checked out. The fact that he/she is vomiting and not eating or drinking, sounds like there is something wrong and you want to rule out that it is not anything serious. Please let us know the progress of your little one. My 4 month old French mastiff out of no where last night went very quiet and not herself. It seemed as if her back legs weren’t working she would try walk to mW and just sit straight down, being very sooky and panting a lot. She was drinking and eating fine but far from her usual puppy self. She seems to not be in pain and is walking this morning but so far from herself? I’ve checked for tics bites and anything else and have found nothing. Any ideas??? In our research, excessive panting often seems to be a sign that something is not quite right. Since we are not Veterinarians, we can’t diagnose, and most would want to examine your puppy. Our research has revealed that it could just be as simple as a cramp, but best to have her checked out if she still seems out of sorts. Please let us know how she is doing and feeling. Thank you for your comment and please visit us often. Let us know if there is any topic you would like us to cover in the future. Your friends with Tails Untold Personalized Pet Books. My boyfriend has a 7 year old great Dane everything was fine until 2 days after I moved in. He starts panting and shaking bad at random times. Appetite has slowed down a bit still drinking and using washroom. Doesn’t appear in pain an still able to run and move. Also restless whenever we move he jumps off his bed. When we lay next to him he stops panting and sleeps. Is this anxity? If pain wouldn’t he pant when moving? Hello and thank you for your comment and question, we always welcome them. We are not Veterinarians so we do suggest consulting yours when you see a change in your pet’s behavior to rule out anything serious. On the surface, it does sound like anxiety, which can be caused by any number of things, including a change in your Great Dane’s environment. Perhaps he is trying to get used to you now living in “his” house and the change has caused him to be anxious. Panting can be a sign of anxiety. Please keep us up to date on his progress. Happy Holidays, too! Hi, I have a 4 year old Chihuahua that weights around 5 pounds. She just started panting very heavily, breathing very heavily and she can’t be still or get comfortable. She will not drink water either. I’m not sure what’s going on with her??? Can someone pls help????? Hello Angela, We highly recommend you contact/visit your Veterinarian. As we discussed, panting can be a sign of so many causes, including pain, stress, anxiety, heat stroke and more. From our research it seems that a change in your pet’s panting behavior, usually means they are experiencing some type of discomfort whether physical or mental. We hope it is nothing serious and please let us know what you Vet says and how your Chihuahua is doing. We care and I am sure our readers would like to know, too. We are very sorry to hear of your pitbull’s situation. As mentioned, not being Veterinarians, we cannot diagnose, but from our research, a change in your dog’s panting can mean a health issue. The best advice we can give is to take your little guy to the Vet to rule out anything serious. We hope it is just a temporary situation, but truly it is best to have him checked out. Please let us know how he is doing, as we really care. Visit our blog often for new and useful information to help make pet ownership the best! Hello Eric, Thank you for reading our blogs. As mentioned in our blog post, excessive panting, or a change in panting behavior can mean a number of things including a health issue. The best advice we can give is to contact your Veterinarian to rule out a health issue. Perhaps, since her poop was runny, she may have a digestive issue, and hopefully it will pass as something she ate that did not agree with her. Once a health issue is ruled out, as mentioned in our blog, it could be an anxiety issue, temperature issue (too cold or hot) since this is how a dog sweats. If a senior dog, it could be a change in cognitive functions. Your Vet may be able to help find the cause for this, too, if a serious health issue is ruled out. Hopefully, it is just a temporary situation. Please keep us informed as we care and we hope she . Please visit our blog often for new posts. It can mean many things, and since she hurt her leg, it could be she is in pain or perhaps she is suffering anxiety from the “hurt”. We suggest contacting your Vet to help diagnose the cause and perhaps subscribe something to ease the situation. Best of luck and please let us know how she is doing. We care! Hello-I have a 9 week old shitzuh and typically throught the night he will have times where he gets hot, starts panting-drinks water and goes back to bed. Well tonight I noticed he was doing it quite often. It seems like the water isnt stopping it, he just keeps getting up and moving and going back to sleep. I keep giving him water but it doesnt seem to stop it like it normally would. He was with his brother all day with a puppy-sitter and I am worried he just over did it. Anything I should be worried about? Should I take him to and ER Vet? Hello Alyssa, Any changes in a pets behavior should be carefully monitored. As mentioned, we are not qualified to diagnose, but strongly recommend when you see these type of changes, that you consult your Vet. Panting can mean many different things, some serious and some not. Sometimes, it is as simple as this is their way of perspiring, but if excessive, it can mean something more than that, pain or anxiety may be the cause, but best to see your Vet to rule out anything serious. Please let us know how your little Shihzuh is doing and we wish him well. Hi there I have two questions for you regarding two of my dogs. First I have a golden ret/chow mix he is a tad bit over weight but not majorly. I’d say prolly around 6 to 10lbs. His personality has changed a lot over the last two years he is getting grumpy and will sometimes even growl at me when I move him or ask him to move from somewhere. I thought maybe a thyroid issue but blood work came back normal. Vet said he does not seem in pain at all which was another knew of my concerns. And then for the last few nights he has started panting like crazy at night to where it shakes my entire bed house normally stays around 65 to 68 so I know he’s not hot, he is restless as well. Eating fine drinking fine not lethargic, still active during day, no coughing anything else any ideas?? Also have a 12-13 year old rotti lab mix and he has started snoring bad at night and sometimes at night it will sound like he is snoring but a deeper snore when he is awake any ideas? Hi Brooke, Very interesting questions, and a reminder that we are not Veterinarians and cannot diagnose. That being said, could it be possible that your rotti lab’s snoring is upsetting your Golden’s sleep and perhaps causing him anxiety from worrying about the Lab? You know how we all get a bit grouchy with lack of sleep and sometimes anxious when something is out of order. The excessive panting usually means there is something upsetting whether it be pain, anxiety, or some other ailment. I would again discuss with your Vet, as it seems the panting has increased. Regarding the snoring issue with your rotti, there could be several reasons: Rhinitis, an inflammation in his nose and could be due to respiratory infections or allergies, a fungal disease, more serious could be a tumor in the nose and should be checked out by your vet. Snoring can also be caused by an abscess from a bad tooth. All of these should be check by your vet. Like with humans, if your rotti is obese, this can also cause heavy breathing and snoring issues. We hope this helps, Brooke. Great luck and we wish your two guys get and stay healthy. Please let us know how they are both doing. We truly care. My 9 year old cocker spaniel was just updated on her shots a few weeks ago and her systems seemed to check out fine. She is now panting and carrying around her favorite alligator. She just ate and went outside (we have weird hours) but she is taking short breaths and panting and it is a cool 73 degrees in our house. I’m not sure if I should take her to emergency care or not, she is not spayed so I think it also could be her going into heat. Thank you for your question. We love Cocker Spaniels. First, we must qualify our answers, by saying that we are not Vets, and we always suggest that when there is a change in your dog’s behavior that causes you some concern, such as excessive panting, mood swings, changes in eating or digestive issues, to name a few, you should consult your Vet. As we described in our blog, excessive or a change in panting behavior can be due to many reasons, some serious and some not so. In our research, we did not find anything (but that does not mean it is not the cause) that says that a dog in heat has excessive or changes in panting. However, being 9 years old, your cocker could be developing arthritis or some similar senior dog health issue. Our suggestion is to consult your Vet, who may want to examine your cocker to be sure there is nothing serious. If the panting is due to pain from arthritis or other reasons, we surely want her to feel better and there are medications your Vet can prescribe to help alleviate her discomfort. Please let us know how she is doing, we truly care! Ben will be 16 in July,he has had arthritis in his back hips and his right front leg,he is on 100mg tramadol twice a day.i always give it to him after food.he’s going deaf ( or selective hearing lol) and his sight is going. But he’s started panting excessively to the point where all u can hear is Ben.if u shhhh him he goes quiet,if u are paying him attention he goes quiet.but if u are doing other stuff he gets louder n louder any ideas on what we can do.other than earplugs? We love your sense of humor, given your situation with Ben. Wow, 16 years in a couple of months, that is great. We are sure you know, arthritis, is very common in senior dogs (many seniors for that matter lol!). Excessive panting, as we stated in our blog, can be caused by a number of things, some serious and some not so, but pain is certainly one of them. The loss of sight and/or hearing (although, probably not selective hearing) can cause anxiety which can cause excessive panting. Since we are not Vets, we are not able to diagnose. We do strongly suggest you consult your Vet to be sure that Ben does not have anything serious going on. The Vet may just need to tweek the tramadol dose or prescribe an anti-anxiety medication. We really hope it is something very minor and that Ben begins to breath more normally. Please keep us apprised of his health, we truly care! Thank you and great luck with Ben. I have a 7 year old mix dog who was acting fine 2 days ago. Took him to the vet they said he was in pain. Gave him pain meds including tramadol. He is still panting and is not lively at all. I am so scared I don’t know what to do. When I take him outside he does walk but when I come inside he looks at the stairs and will only come up if I put him on the stairs. When we are outside he is straining to poop. I’m spending hundreds at the vet and no help. Please help me. Hello Nicole, we understand your concern, how scary to see such a change in your guy’s behavior. Since we are not Vet’s, we cannot diagnose, but only make suggestions. I would call your Vet who prescribed the pain medication,(sometimes pain medications can cause constipation)and before he/she puts your little one on more meds, try to find out how your the Vet knew he was in pain, outside of just panting, and what he/she feels is causing the pain. If you do not feel you are getting a satisfactory answer, perhaps you should try another Vet, if possible one that is recommended in your area. There is nothing worse than seeing your little one in pain. We hope he gets well and please let us know, we care! Hi Dawn, as we state in our article, panting is necessary for dogs since this is the equivalent of a human perspiring. With the warmer weather, dogs tend to pant more to cool down. Drinking more water than usual happens in the warmer weather, too. From what we know, if the weather is extraordinarily hot, it is not a good idea to leave your pet outside. Although you have shelter for him, that is a help, but if the temperature is excessively hot, it is best to have him in a cooler place. We wish we could guarantee he will be ok, but unfortunately we do not have a crystal ball. We do need to reiterate that we are not Vets and therefore cannot offer any type of diagnosis. Our blog is for informational purposes. If your dog is still panting excessively, even when in a cooler environment, we do suggest taking him to a Vet. We are hearing more and more about areas that offer assistance to help pay for Vets and perhaps there is something like that in your area. Great luck with him and please let us know his progress. Hi. We have a really old 10 year old female pug. She is incontinent and struggles to walk. She has lost the ability of her hind legs. She seems still mentally intact and she really loves being around people. Recently she has been panting very heavily. We do not have money for a dog wheel system for her. We think she is in a lot of pain, but don’t have money for a vet. Scared to medicate her at home because shes… a dog. And an old dog. Is she going to die soon? Should we put her down??? It’s very sad, it’s like she still wants to live. We are so sorry about your little female pug’s change of behaviour. As mentioned, we are not Vets and cannot diagnose your special female pug’s situation. Panting is a natural behavior for dogs, but excessive or heavy panting can be due to pain or anxiety or other issues. When a pet’s panting changes, not due to air temperature, something new that would cause excitement or temporary anxiety, we do recommend seeing a Vet for diagnosis to be there is no pain, suffering or something serious going on. We have heard about situations where a Vet will work with you to help pay for the visit, eg. payment over time, or a deep discount for those that cannot afford. We suggest you call your Vet and explain your pug’s and your situation and see if they will help you out. We hope that it is not serious and your little one gets well, soon. Please come back and let us know! We care! I have an 11 year standard female labradoodle that in the last 6 months has been groaning a lot during the night. Every time she moves, she groans. She seems fine during the day – has trouble with back right hip when getting up in the morning or moving after laying down for a while. I have been giving her glucosamine condroitin tablets every morning – they seem to help at first but she is starting to groan more at night. Is there anything else I could give her to help ease the pain. I have heard of some people giving their older dog aspirin. Any help much appreciated. Thank you for reading our blog and commenting, Diana. We are so sorry about your labradoodle’s health issue. It is so hard to know that your dog is in pain. Everything we read and research says that giving Aspirin, Ibuprofen, Tylenol, also called NSAIDs (non steroidal anti-inflammatories) can be dangerous for your dog (or any pet for that matter). Many Vets have seen where pet parents have administered these in the wrong dosage and this can be deadly or cause dangerous side effects. They all say any pain medication should be given under the supervision of a Vet. There are many pain medications that are on the market specifically for dogs of different sizes, etc. and all pets, which your Vet can prescribe. We hope this helps and we hope your labradoodle gets the proper diagnosis and help. Please come back and let us know! We care! I have a 14 yr old daschund who is diabetic and now on thyroid medicine his teeth are in pretty bad shape my vet keeps him on 10 day regimens of antibiotics once a month he is pretty much blind due to the diabetes and his hearing isn’t good either he also sleeps a lot lately he will pace and pant for awhile what could this be from. Thank you for visiting our blog and commenting. It sounds as if he may have anxiety and perhaps a bit scared due to the hearing loss and being blind. Is he eating well with his teeth issue? Hopefully, he is not in pain, and may just need an anti-anxiety medication. In most cases, your Vet should be able to diagnose whether he is in pain or just suffering from anxiety. Another thought is the medication is causing the extra sleeping pattern. We do know that senior dogs do sleep more, too. Let us know how he is doing, we truly like to hear back. Again, we appreciate your visiting our blog and come back often for new posts. Hi, we have a 17 (18 in January) miniature poodle. He has always been trim and active but has showed signs of slowing down over the past year. We knew this was going to happen but figured it would be as slow as it had been..however, over the last three months his arthritis (which we were told about-but never seemed to slow him down) has been very noticeable. He has urinated while standing in front of us and following walks (never did this in the house) same with pooping sometimes in the house-due to his age I buy plenty of Clorox wipes and am thankful for hardwood floors. What scares me is that he has been panting for no reason, waking from his sleep (which is most of the day and night) and pants, coughs, circles, sleeps again. He loves being around all of us-although doesn’t remember some of my kids when they come home from school. He enjoys when he is awake and cuddles etc. my question is, what should I look for when any final decisions need to be considered? I am heartbroken thinking of this, but don’t want to see him suffer due to my being blindly in love with him (my husband jokes I would put him down first). We are sorry to hear of your senior miniature poodle’s condition. Often, we hear about this happening as pets age, so if it is any consolation, this seems to be the progression of an aging pet. Regarding final decisions, it truly is a personal one. My dear sister had to put her senior dog named Scrappy, down recently. Scrappy could not get up by herself and would wince when she laid down. She was on pain medication, arthritis and anti-anxiety medication. She also had incontinence and it was getting to the point where Scrappy’s quality of life was no longer there. This helped my sister (who had also consulted the Vet) make the decision that it was time to put Scrappy to sleep and let her go to the Rainbow Bridge. She was glad to learn that there was Pet Home Hospice care and they came to her home. This made Scrappy much more comfortable and at ease in her own home when the time came. This is never an easy decision, but we do believe you will know when it is time. Not wanting him to suffer is very unselfish and loving. Great luck and it is nice you have a husband that is supportive and has a sense of humor. Please feel free to let us know how you are doing. We care! I have a 15 year old German Shepherd who pants and paces around when up.She is on meds for incontinence and has been pooping in the house. Vet has given her selegiline for confusion but it doesn’t seem to help. She is deaf and I think going blind as she is going into things. She has been having trouble getting HP and sometimes needs rear support when eating. Am I doing everything I can for her or is it getting time to think about euthenasia? We are so sorry to hear of the issues your 15 year old German Shepherd is having. Yes, it truly sounds like you are doing everything you can, starting with seeing and consulting your Vet. Since this is their profession and expertise, they are usually the best place to start to help diagnose and offer the best treatment for senior pets (and all pets for that matter). In terms of Euthenasia and the best timing for this decision, it truly is a personal one. We have found, most of our readers, seem to know or have a good indication when it is the “right” time. Often, they see that the quality of their petkids life is no longer there, due to pain or their mental state. They often consult with their Vet who can offer advice and assistance, but ultimately they will let you make the final decision. None of us want our pets to be in pain, or in a “mental” state where they just don’t seem comfortable due to loss of sight, hearing or severe cognitive impairment and where medications just aren’t helping. It is a very tough decision, and hopefully, with your Vet’s guidance, and your instinct, you will know in your heart when it is time. We are sending you and your senior German Shepherd many prayers. 17 year old Golden Ret/lab, 1 year cancer free. Has developed heavy breathing recently and today could not stand up. Have talked to our vet and I am taking her in tomorrow. Otherwise she is in good shape and spirits for her age. I never considered her heavy panting to be an indicator of possible something else(was thinking the worse). Being 55+ myself I am familiar with arthritis. I guess the point of my posting is to thank you for your website, it is a valuable source of information, and in our case comfort and hope. Dear Jack and Brandy, Thank you so much for your posting and you are very welcome. 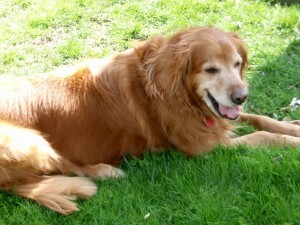 We hope your 17 year old Golden/Lab is OK. We are so glad you are visiting her vet to be checkout out. Best of luck and please let us know. We truly care! I have an 11yr old pure female Pitbull. She is spayed. She was hit by a car at 1 and a half yrs old. She has hip dysplasia. I know she is in pain I have noticed she has a few bump masses, my husband said it’s a fatty build up. I don’t believe him. Lately I have noticed she will pant heavy, head gets warm, she has thin hair so I can easily see when she’s panting abnormal that her head gets red. I as a mother sense she may be running a fever, as her head will be warm but body is cooler. I am calling to get her to the vet. She won’t let me leave anything on her to cool her down, and refuses ice. I am going to make a vet appt when I wake up in the morning. Could this be something that needs addressed as an emergency? What can I do for her til the appt? I’m very worried about her health as she is getting older. Hello Nicola, We are so glad your first response is to call the Vet, since you said this has been happening lately and that it has been going on for a few days. We cannot know if it is an emergency but given your description, and your belief she is in pain, I think you are right in going to the Vet as soon as possible. Since it is not recommended to give any kind of medication without a Vet’s advice, the best thing you can do is to keep her as comfortable as possible until the visit. We hope your Vet can see her right away and we would emphasize when setting up the appointment that you are sure she is in pain. We also hope your Vet is able to diagnose the problem quickly and is able to provide whatever is needed to help her be comfortable and without pain. Please come back and let us know how she is doing, we care. 6 years, and she is not active anymore. She gets out of breath easily and starts panting. After a few minutes she falls asleep, and will usually sleep right through the night. Her normal time to get out of bed is about 9am. I suspects she is about 12 -13 years old. She pants quite often, and I suspect that she is in pain. She has cataracts in both eyes and seems to have difficulty seeing. Can I give her half an aspirin every second day to see if that will help? Great that you are asking about the aspirin. All of the research we have done on the issue of giving your pet “human, over-the-counter medications, (and same for Dr. prescribed) tell us to check with you Vet first. They say that the dosage for a human does not always translate to a pet. There were some tragic stories of pets being allergic to certain medications and those that were given too high a dosage. As you mentioned, her panting could be caused from pain, or perhaps anxiety from not being able to see well. Please check with your Vet and please come back and let us know how your Border Collie is doing. All of us at Tails Untold Personalized Pet Books care about your pet and you! So glad you found this helpful. Thank you for your response. Hi, I have a 13 year old pug who has a heart issue and has been into the vet multiple times over last few months for check ups and to fill prescriptions she is taking for the heart as well as a pain pill for her back and disc that is degenerating. Over the last two months she has panted heavily id say almost every day and only time she doesn’t Is when she sleeps through the night and into the next morning. Essentially if she can relax all morning and day because I’m not at work she just sleeps and is fine but otherwise she is panting. The vet today when I asked to bluntly tell me her level of comfort said she has a year to two years of life left in her. That somewhat shocked me although it’s good news, my question though is when does it get to a point where the panting is too much for her? Thank you for very much. Hi Nate, that is a very good question and unfortunately we don’t have the answer. In all our research, senior dogs do pant more often, which as stated can be caused from a number of factors including but not limited to anxiety, pain, obesity, overheating, and more. In terms of when is “enough panting is enough”, this really depends on your pet’s behavoir and if you see her behavior changing. Your Vet, who has experience with this issue, seems to feel your Pug has a few more years, even with her heart and back issues. If the panting becomes more excessive than usual or if she seems in pain, then another trip to the Vet would be in order, so they can observe this excessive panting, perhaps run more tests to rule out anything more serious. This would also be a good time to discuss your major concern of not wanting her to be in any great discomfort. We hope this helps and please feel free to write again. We always love to hear the progress and hope it is positive. Hi Nate, that is a very good question. In all our research, senior dogs do pant more often, which as stated can be caused from a number of factors including but not limited to anxiety, pain, obesity, overheating, and more. In terms of when is “enough panting is enough”, this really depends on your pet’s behavoir and if you see her behavior changing. Your Vet, who has experience with this issue, seems to feel your Pug has a few more years, even with her heart and back issues. If the panting becomes more excessive than usual or if she seems in pain, then another trip to the Vet would be in order, so they can observe this excessive panting, perhaps run more tests to rule out anything more serious. This would also be a good time to discuss your major concern of not wanting her to be in any great discomfort. We hope this helps and please feel free to write again. We always love to hear about your pet’s progress and hope she stays well. My approx. 9 year old mut (looks like Toto from the wizard of oz, so she is like a terrier) is panting abnormally even when sleeping at night. Vet saw her today and asked nany questions which in summary my dog is not having any other symptoms, she is eating dring normal, same behavior as always, moving normal, etc. He examined her with his estetoscope, examined her mouth, head, body and took her temperature abd said she has nothing, to ignore her panting. Can you please help me understand this? May Dogs pant abnormally and not have any physical thing going on, including pain? Could it be anxiety? I did nit have s chance to ask the Vet why the panting…and he also did niot want to charge for the house visit. Thank you! As we know, dogs normally pant to cool themselves versus sweating like humans. After a workout or when the temperature rises, dogs will pant more frequently. The fact that you noticed her panting behavior changing, and you took the correct first step in seeing your Vet to rule out that something serious medically might be going on, seems to indicate that she might be suffering from anxiety or stress related to a decrease in certain cognitive functions. Many senior dogs, an age usually considered 8 yeas plus, can begin to experience cognitive changes, a condition that is more behaviorial than physical. This can cause increased anxiety or stress. Your Vet sounds so nice and I understand you don’t want to take advantage of his generosity, but a call to discuss this possibility seems in order, as there are medication that can help alleviate anxiety and help your little lady be more calm and comfortable. We also suggest, in our article, that you watch closely for other signs such as restlessness, constant licking at one spot or difficulty getting up or down, as those can be signs that she may be suffering from some form of pain. We hope this helps and please let us know. Thank you for visiting our blog and for your question. Hi. My 9 year old Great Dane has been having spontaneous bouts of heavy panting that usually last about 30 minutes. She also spontaneously makes this weird “gagging” sound about 3 times a day, sometimes less, sometimes more. she has also started licking, almost compulsively. She will mostly either lick the area on the couch where she is laying until it is drenched or lick her front leg excessively. Do these symptoms sound familiar to you as being a specific condition or illness? Thank you ahead of time for your help! Hello Jeannie, we are not sure what happend to our reply to your comment. We apologize for this. As mentioned in our blog, heavy panting can be caused by many reasons, including overheating, anxiety, pain, and more. Excessive licking can also be from anxiety or in some cases obsessive disorders where they over-groom themselves. Some studies have shown that licking can increase the endorphins in the dog’s brain which can help to calm and relieve some of anxiety. In most of our research, as dogs move on to their senior years, they may lose some congnitive functions and this can cause anxiety. Another reason for excessive licking has been attributed to a GI disorder or nausea and perhaps this is causing the gagging. It is interesting to note that if your Great Dane does not have a GI disorder or other underlying medical problem, the licking of your couch could cause ingestion of fibers and or hair, and this could in turn could eventually cause a GI problem. It would be helpful for you to observe and take note of when the licking occurs, and any other changes in her behavioral. This information will be very helpful when discussing this situation with your Vet. If it is anxiety, there are medications and/or other ways to treat this disorder. It would be best, too, that your Vet rules out a GI issue. In some cases, an oral compulsive behavior has been linked to a neurological problem, but mostly if your Great Dane won’t let you interrupt the licking behavior. Since this behavior has just begun, and not something that has been ongoing for months/years, then a trip to the Vet is the best advice we can give. Your Vet can rule out anything serious, and if it is anxiety, this can be treated very easily. We hope this helps and please let us know how she is doing. We care! My 15 year old Litl Fox Terrier was doing fine until we took her to the beach to get out and ever since then she has been panting mostly at nights and after a short while she stops and her heart beats faster than usual?? ?? Hi Alaina, So sorry about the changes in your Little Fox Terrier’s panting behavior. It could be that, since she is a senior dog, she may have increased anxiety when leaving her normal home setting. The beach and all its smells and sounds might have caused the panting due to an increased axiety level. If after a bit of time, in her home, the excessive panting and increased heart beat continues, it may be wise to take her to the Vet, who can rule out anything more than this, and can prescribe anti-anxiety meds for times when this happens. Hello Sandy, Thank you for reaching out to us. In researching certain causes, one came up that sounded like it could be a possiblity for your red cattle dog. It is called sundowning. It is a syndrome that can effect patience with Alzheimers or dementia and senior dogs, (age 7+ depending on size and breed), can get Alzheimer’s and demential, too. Sundowning causes confusion and agitation that begins in the late afternoon or early evening when it begins to get dark. If you would like to test to see if she has this syndrome, we suggest turning on extra lights when she goes outside at night, and if possible, put on extra lights in your home by the stairs. She may still want to stay downstairs where the light is, but she may be calmer. Another suggestions is, if possible, keep extra light on at the top of the stairs. The extra light can help eliminate frightening shadows. Obvioulsy she must have decent vision for this to help. It is not uncommon for senior dogs to get Alzheimer’s or another form of dementia, and pacing, unexplained restlessness, change in behavior, especially in the evening or at night can be a sign. When visiting your Vet, explain her change in behavior. There are tests they can run to see if this excess panting is from the anxiety caused by losing some cognitive functions or some other medical issue. The good news is that there are medications that can help calm her or alleviate her anxiety if dementia or alzheimers is the diagnosis. We hope this light test helps and that she calms down at night. Great luck and please let us know, we truly care. update it often. More frequent updates will give your blog higher rank & authority in google. help yourself with miftolo’s tools which will shorten the time of creating an article to a couple of seconds. Hello LottieJuicy, Thank you for reading my posts and your advice. I will check into miftolo’s tools and also try and post more often. Hello blogger, i’ve been reading your articles for some time and I really like coming back here. Hello and thank you for reading my articles and your comment. I will look into drake’s tricks and appreciate the advice. my 10 year old dog started panting as soon as she starts her walk, it is not hot weather, when we return home it all stops, been to vets tested for heart lungs and kidneys all ok, she has slight arthritis vet gave her a weeks tablets for this made no difference to her panting, this has been going on now for 3weeks don,t know what to do for her now. Thank you, Elaine, for reading our blog and your comment. We are so sorry about your 10 year old dog and her new panting situation. Often, we hear about senior dogs starting to pant and the difficult in diagnosing why. If it is arthritis, one would think the pills the vet gave you would help. As stated in the blog, pain can be a cause of excessive panting, and the fact that she pants only when going for a walk, that would be at least one reason. Did the Vet say how long it would take for the pills to begin working? Perhaps a week was not enough time. Another thought is anxiety, as dogs age, they can develop new anxieties, which can cause panting. There are some very good medications for anxiety in dogs. The good news is the vet did all the tests he/she felt necessary and it appears there is nothing seriously wrong. If it were my dog, I would consult the vet again, and discuss the arthritis pills not working in the weeks time. Perhaps he has another medication for this. Also, he may recommend an anti-anxiety medication. Elaine, we hope the reason can be diagnosed and alleviated. It is so hard to fathom our pet kids being in pain or suffering in any way. How much better it would be if they could talk and tell us what is bothering them. If you have the time, please let us know how she is doing and we hope she improves. We care!